Being on the road, visiting customers, attending all kinds of different events and trade shows there is alot of paper piling up in my suitcase. Be it receipts or business cards, but I have found a solution that works really well for business cards (got a suggestion for the receipts? Let me know!) and that is an iPhone/iPad/Android app called CamCard. What CamCard does is that it allows you to take a picture of a business card which it then analyzes with some kind of super duper magic algorithm, which I think they refer to as OCR. Basically what that means is that it extracts the information from the business card such as name, email, website and organization and adds it to a card holder without you having to type a single letter on the tiny smart phone on-screen keyboard. CamCards card roll where the photographed business cards are stored. This has for me proven to be a very powerful tool when returning from trade shows where I usually have a lot of business cards piled up in my inner pocket. What I have seen in the past with many of my colleagues is that there is a tendency to stash these cards in a drawer, forgetting about them and then desperately searching for that person from that company that I met at that trade show, not a good way to go about it if you ask me. 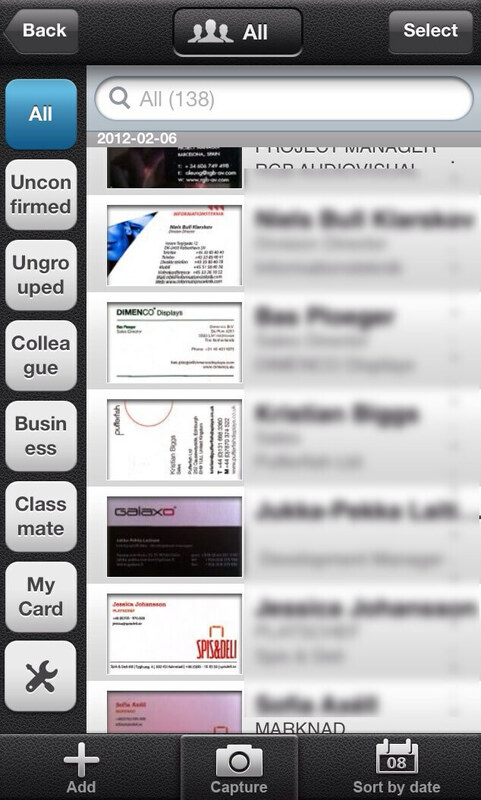 Using CamCards built in batch mode you can easily snap photos of 20 business cards in just minutes and then leave the app to its own devices analyzing the information and adding it to the card roll. Each card you have scanned is stored in the card roll with the original picture on top of the extracted information, should you need to go back and make corrections or verifications (which is actually a very user friendly procedure). There are some small but important extra features packed into CamCard such as an automatic search for profiles on LinkedIn so you can easily add contacts right away. You can also set which languages that CamCard should default to when scanning cards, to increase accuracy and formatting. 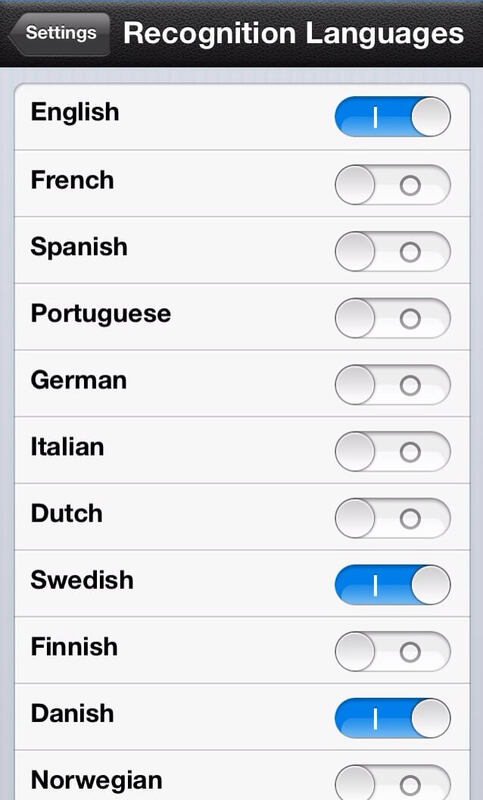 In my case I have it set to English, Swedish and Danish which are the languages in which I receive most of my cards. Select which languages you would like to default to when scanning your cards. I won’t say that I have tried them all, but I have tried many card scanners in my days and this is by far the one that I feel is the most accurate and user friendly, the batch scanning and correction of scanned info is very efficient and easy to use. So, go get it! There’s a free version available that has some limitations and ads so you can try it out, but hey it’s Christmas, why not give yourself or a colleague a useful present it will set you back about $2.99 as it is on a time limited 60% sale right now! This review is for the iPhone version, but it is also available for the iPad, Android and more (check their website).